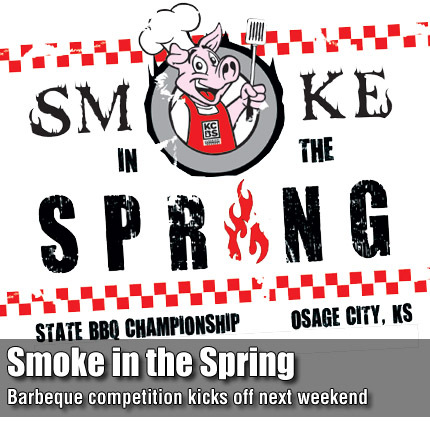 OSAGE CITY—The eighth annual Smoke in the Spring barbecue contest returns April 8-9 to Osage City. This year’s contest will feature 83 barbecue teams. Most of the events will take place at Jones Park, with a Saturday afternoon car cruise in downtown Osage City. For the general public, the event begins at 6 p.m. Friday evening with the “Taste of Osage City,” a chance to sample the competition cookery of 32 contest participants. Teams will only accept BBQ Bucks as payment during the two-hour dinner, which can be purchased at Osage City Hall or Edward Jones. Bucks will also be available at the event from 4-7 p.m.
Sign-up deadline for the Kids Q competition is 4:30 p.m. April 8. The Kids Q contest is open to all children, with two categories, 10 and under, or 11 and older. There will be a registration fee, and all food must be cooked on site. During Friday’s activities, a lawnmower demolition derby will begin at 7 p.m. at the old grandstand in Jones Park. Old Skool will present live music at 8 p.m. in the OCPR building. The Osage City Band Booster Club will serve pulled pork, sides, and drinks from 11 a.m. to 1:30 p.m. Saturday in the community building. Barbecue contest winners will be announced at the awards ceremony 4 p.m. Saturday afternoon. Other Saturday events will include a car show at Jones Park, followed by a classic car cruise downtown beginning at 4 p.m., and an evening movie presented by the Osage City PTA in Santa Fe Park. Smoke in the Spring programs are available at Osage City Hall, Edward Jones, Bank of Osage City, The Osage County Herald-Chronicle and other sponsoring businesses.